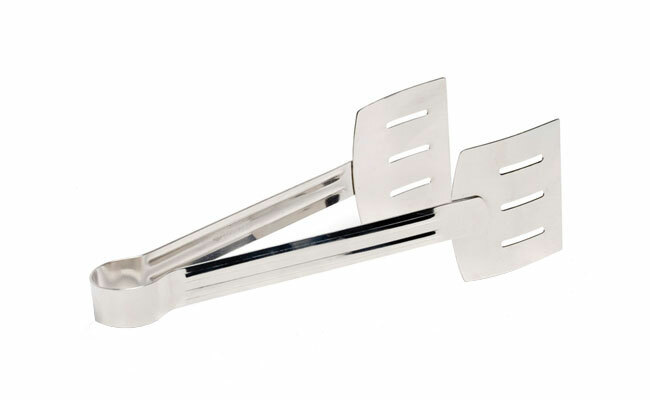 Kitchen tongs available in stainless steel or polycarbonate are ideal for a multitude of kitchen tasks. Whether you’re tossing salads, BBQ’s or general grilling and frying, our durable kitchen tongs make the handling of hot food easy and safe. Blending stylish materials with sleek curves, the kitchen tong can be used on non-stock surfaces without scratching the coating and can maintain high levels of heat whilst remaining dishwasher safe. For reliable wholesale kitchen tongs, look no further than Pattersons Catering Supplies. For all of your chef and baking professional cooking, view our range of kitchen utensils online at Pattersons Catering Supplies today. From commercial kitchen tongs, serving utensils, ladles, kitchen turners, kitchen tongs and spatulas, we have all the commercial kitchen utensils you require and more. Take advantage of our next day delivery options by ordering online at Pattersons Catering Supplies today. Heavy Duty Stainless Steel Tongs, 9.5"
Stainless Steel Serving Tongs 9"
Stainless Steel Salad Tongs 7.5"
Sausage & Spaghetti Tongs, 7.5"
Green Tongs Colour Coded 12"
Black Tongs Colour Coded 12"